In Guangxi Province, classic jasmine scenting is accomplished in the traditional style of Fujian Province in eastern China. This requires that several layerings of fresh flowers are added to high quality tea leaf until the leaf is permeated with fragrance appropriate to the degree of scenting desired by the tea master. The Jasmine flowers most highly regarded for scenting tea are those of the late-summer-blooming jasmine varietal plants, which means that production of Jasmine tea can be from mid-July until the months of early fall. Guanxi Province excels in growing the type of jasmine plants used for high-quality jasmine tea-scenting and we are pleased to have this as our primary, classic jasmine tea offering. This method of scenting Jasmine tea – using only natural blossoms in multiple additions – is the most traditional in China, having been perfected over many centuries of practice. It is painstaking work and must be done most carefully, as the heat generated alone is challenging enough to daunt most amateur ( or even accomplished ) tea makers. The leaf must be perfect in style and level of oxidation – neither green, white, nor oolong – but it must be the unique base tea required for jasmine tea production. The quantity of blossom added to the leaf and the amount of time they are combined will determine the quality and style of the finished tea. Only experience will form the basis for this complex procedure, no machine can predict what the hands, eyes, nose, and mouth can sense. The majority of Chinese tea drinkers favor Jasmine tea that has been modestly-scented and has had all the flowers removed prior to being offered in the marketplace. It is generally not considered a positive to have blossoms in the teapot or cup – once they have done their job they should be removed and the finished tea left to stand on its own. 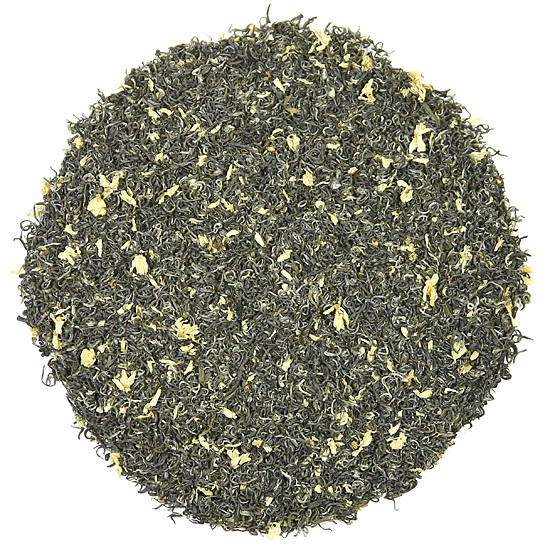 Spring Hao Ya is a high-quality, Chinese-style Jasmine tea. It is a much higher quality than the price suggests. It has an elegant leaf and high scenting – the perfect cup for those who love both Jasmine and tradition. 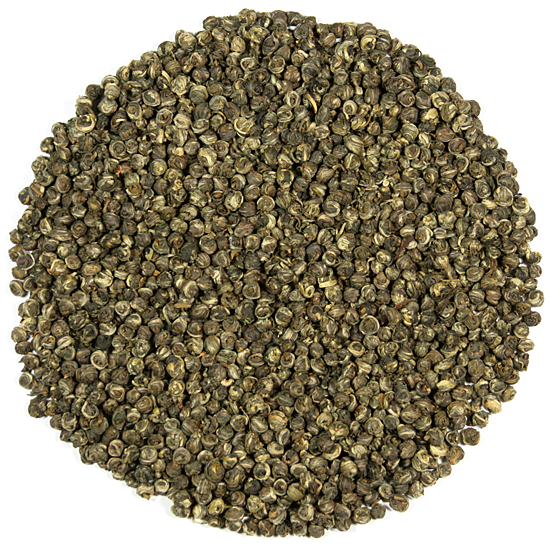 The Spring Hao Ya that we are offering right now will yield very slight astringency in the cup and a bright, brisk flavor riding on the smooth rich taste of the scenting. Though tea is rarely drunk with a meal in China, when it is, Jasmine is one of the teas that might accompany food, particularly hot, spicy foods in the region around Chongqing, or with winter fare in the north, especially in Beijing. The best Jasmine teas, such as those sold by Tea Trekker, are made using fresh jasmine flowers that bloom from late August through September. 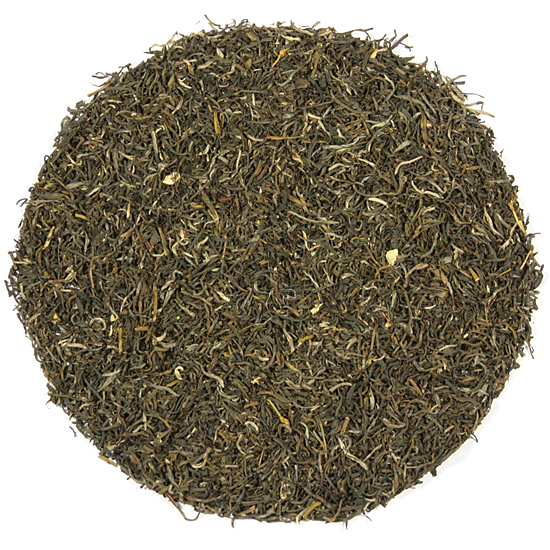 Jasmine teas are seasonal teas and are ready for sale after October of the year in which they were made. Traditional Jasmine tea (Jasmine tea that is scented using fresh flowers and not artificial perfumes ) is made from fresh tea leaf that is picked and semi-processed in the spring, and then put into storage until the jasmine flowers bloom over the summer beginning in early July. Tea Trekker tends to prefer the varieties of jasmine that bloom a little later in the season, as they have a purity of scent and are rich and smooth. When the fresh flower buds arrive in the tea factory, the semi-processed tea is taken out of storage and ‘married’ together with the fresh still-closed buds. As the blossoms open in the evening the scenting process begins. 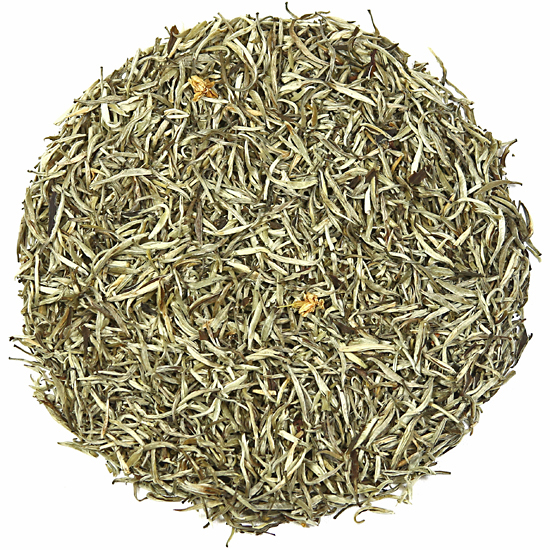 Because Jasmine tea production exposes the leaf to some heat during the processing, the leaf used for it is neither green, white, nor oolong tea, but a partially-finished leaf that is unique to Jasmine tea processing.